Grey AwaReviver YSASQY-01 is a computer desk and racing gaming chair thatf is made of PU leather and has a beautiful, sleek, modern and ergonomic design with a high back and plenty of support on headrest and lumbar. It can be used both as a gaming and office chair by those that want plenty of comfort all day long. 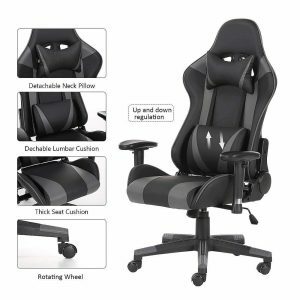 This great modern racing chair is one of the number 1 best sellers on Amazon.com in the office table and chairs category. As a premium quality gaming chair it comes with a detachable headrest pillow, a lumbar cushion and an adjustable backrest. And if you care about your comfort level when you are gaming or working, this one is very much worth considering. AwaReviver is built very sturdy with the high quality internal and external components and offers efficiency, functionality and user-friendliness. It is designed to suit different types of bodies, small or large, short or tall with its very sturdy metal frame and PU leather (artificial leather), all of which contribute to the durability of this great chair. The total user weight capacity is specified as 300 pounds on the product page. The company claims that all the parts on their chairs go through very strict tests from the beginning to the end, before they go out on the market. You can be confident there will be no shaking or wobbling in whatever direction. 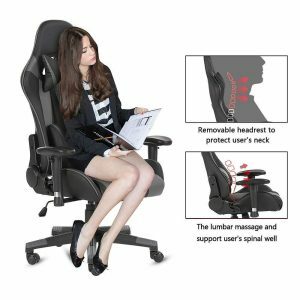 You can adjust the chair the way you want (including the backrest and the hand rests) and the head or neck pillow and lumbar cushion are both great for those sitting on the chair for many hours or all day long. The seat cushion is very thick and comfy and you can move the chair easily on its rotating wheels. The company stands behind their products and offer a 30-day money back guarantee without any questions asked, a three years of quality warranty and a decent customer support. You can contact them via email or phone if you have have any questions or issues that want resolved as soon as possible. You can shop without worrying and with a peace of mind. Playing your games on this chair or working or studying at your desk will be more fun, enjoyable and comfortable. AwaReviver YSASQY-01 is quite easy to maintain this chair or its accessories or keep them clean. The backrest is made of PVC and stylish ridged cotton and can be adjusted between 90 and 155-degree angles. It includes the gas pressure tubes, class 3 gas lift that is verified by SGS. We don’t have the measurements for the chair yet, but the package measures 33.9 x 22.8 x 12.6 inches. Please follow the new futures and reviews that should appear soon at Amazon.com.